Picture: Migrant football worker in Switzerland. With the EURO 2008, the European football championship, in full speed, Zurich, as one of the host cities, is full of football fans. After two matches we Swiss are already out of the championship and euphoria has subsided somewhat. I have to admit that I do not like football at all (too many pretty sissies on the field). 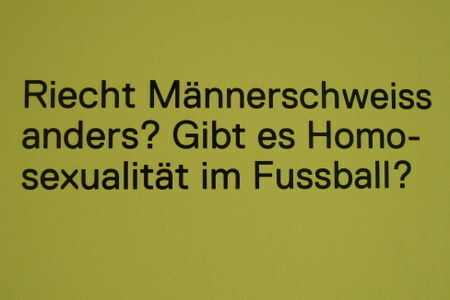 Nevertheless I visited an interesting exhibition in the Helmhaus Museum in Zurich. By the title “Balls and Brains” the museum invited artist to look at football from different angles. Besides the mandatory pictures of sweating Beckham and Rinaldo the exhibition sheds a light on corruption and crime in football. Another interesting aspect is that many “Swiss” players come from African or Eastern European countries and football seems to be a big career opportunity for them. However, I was surprised to learn that the Swiss BSC Young Boys (sic!) football club got a player from China! 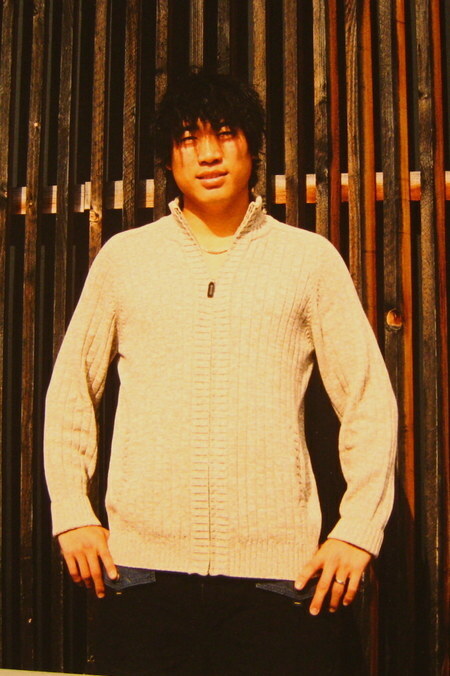 Shi Jun He is playing in Switzerland since 2005 and even speaks German by now. It seems that football can be an exclusive way of integrating foreigners into Switzerland and giving them a career opportunity. 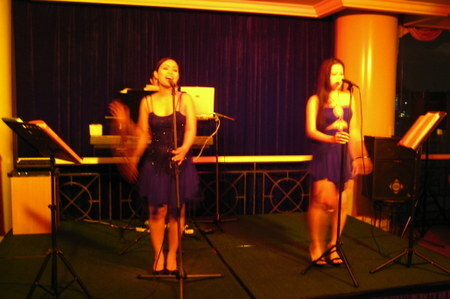 Picture: Philippino hotel band in Chengdu, China. 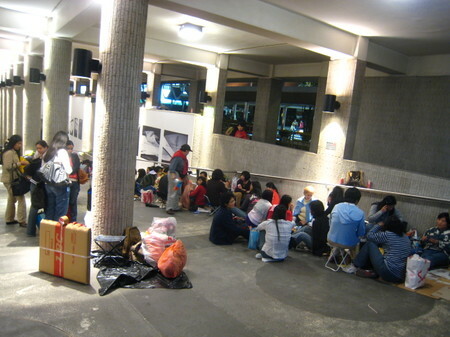 Two things have not changed since my last visit to China: every Sundays Philippinas, who are mostly employed as domestic workers in Hong Kong, congregate at the Statue Square on their day off in order to play cards and chat with each other. And Philippino bands still play the most recent pop tunes in hotel bars across China (we listenend to some in a hotel in Chengdu). Picture: Domestic helpers from the Philippines in Hong Kong. I recently had dinner with a representative of the Greater Zurich area marketing unit that tries to sell Zurich and its surroundings to foreign companies as an attractive place to set up a company. Apparently most foreign companies come from Germany, followed by the USA. The marketing unit also tries to attract more Indian companies. They invite the top management to Zurich and organize meetings with international companies already based in Zurich. The Indians seem to be always very keen but eventually never make any decision. On the contrary, they tend to come up with a long list of tedious questions they want to have answered by the CEOs they meet. Looks like Indian managers are even fussier than Swiss managers! PS: American companies apparently prefer Switzerland to the Netherlands as the Swiss are perceived to be harder working and drop in on work also on Saturday. Japan is normally viewed as a very homogenous society and foreigners might be fooled to believe so as the biggest foreign population in Japan is Koreans, which are sometimes hard to tell apart from Japanese. But the biggest source of new foreigners, according to the Economist, is the Chinese who doubled in numbers to 500’000. The majority come as students with brides as a distant number two. Chinese students make up two-thirds of international students and after finishing university they are eager to join the big Japanese firms. 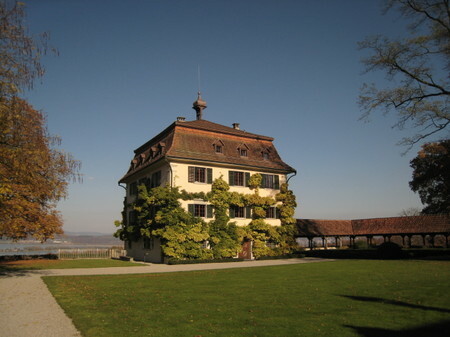 Picture: Location of the UBS Art Forum on Wolfsberg. In the West we still nourish the idea of the poor and starving artist of the likes of Vincent Van Gogh. The Chinese in contrast are much more pragmatic and see art also as a good source of income, as an artist or collector (but then again, the American artist Jeff Koons employs over 80 artists and just does the concept work for his art. So he is not really the starving artist, especially as his works sell at 15-20m USD). As in many things Chinese try to copy Western concepts and try to make a business out of it. So it is not uncommon to find that a Chinese artist also has a property development business on the side: business and art do not contradict each other in China. As the Cultural Revolution wiped out most of traditional arts and craftsmanship (it was considered Bourgeois), art only recently started to come into bloom again with for example over 200 galleries in Beijing and artists like Ai Weiwei gaining international recognition. Now there is an emerging Chinese middle class that starts to collect art , often also as an investment (testament to this is the fact that some works were auctioned three times during one year!) The newest artist generation was born after 1972 and has not experienced a severe crisis. Often they do not pursue the same political topics anymore as the artists born before 1972. According to Urs Schöttli has China an ambivalent relationship to its neighbours, particularly Japan which it admires and despises at the same time (Mangas, the Japanese comics, are for example widely read in China). China still admires USA as it is the country that so openly pursues the quest for wealth and riches and loves the display of wealth. With the renaissance of China its government also becomes more ambitious and recently declared that it wants to buy international brands (which might be better than copying them). Mr. Schöfftli also believes that Europe gets marginalised as the lingua franca nowadays is English and not German, French or Spanish. He feels that this will hamper Europe’s prospects. 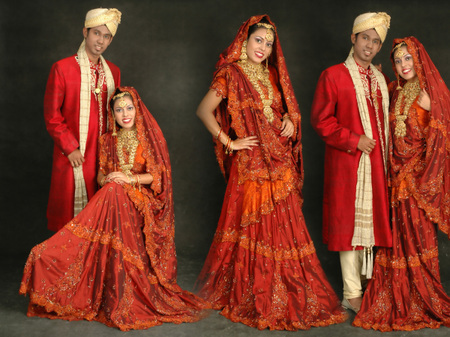 P icture: The Hindu couple dressed up in traditional dresses. It is customary to take wedding pictures before and during the Hindu wedding. The pictures are done by a photographer specialised in wedding photography and the procedures does not allow for any alterations. The groom and the bride have to dress up, put on make-up and pose according to the photographers orders (and he gives strict orders, believe me)! The photographer than adds some finishing touches with photoshop, adding effects and poetry. 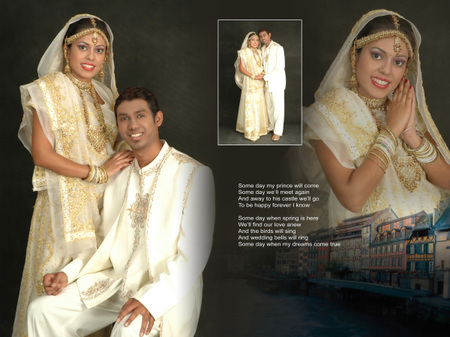 Here are pictures of wonderful Rajini and handsome Veeknes before their wedding in Kuala Lumpur. Lovely! used to be famous for its nature. Now it is notorious for its long-term and ageing dictator Mugabe. Due to him, violence and corruption it certainly does not rank as premier lifestyle destination. I met a family who lives there despite the odds and told me how one can live anyhow a wonderful and easy life if one has the financial resources to support it. They live 100km away from the capital Harare in the middle of nowhere on a big plot of land. And they, like the locals, get up early at around 5.30am and go to bed at around 7.30pm. During the notorious power cuts they use their own generator and a huge refrigerator for storing food protects them from starvation as food shortages are common in a country with 13.000% inflation.The problem of living in a remote location is that shopping is rare experience. The father for examples buys cars from Japan or Britain via Ebay. After successfully bidding for the car a friend of his in England picks up the car and ships it to Durbin, South Africa. There the father picks up the car and drives it home (mind you that the import duty is 121,5%). I asked him why they live in Zimbabwe and his reply was the following: first he was born there. Second nowhere else could he have such a pleasant lifestyle with servants and houses. And third nowhere else would he have so much spare time. So he does not mind the 13000% inflation and that bribes and breaking the law are a way of life. I am tempted to visit them. 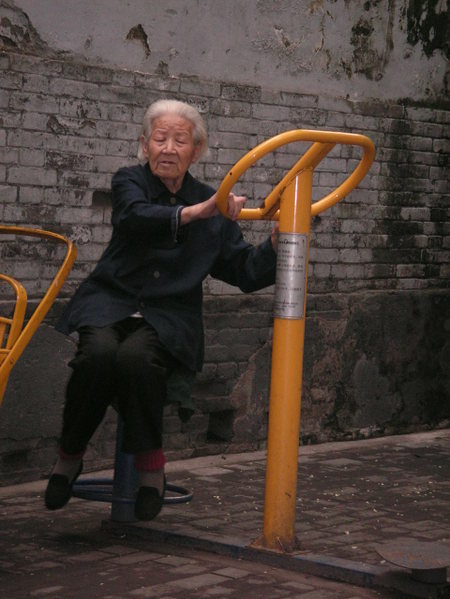 Picture: A Fitness Life Zone in Beijing. Another cultural revolution is underway in China. In preparation of the Olympic Games, which will be hosted in Beijing next year, the Chinese Communist People Party is very concerned with the image of its citizens abroad. Besides building impressive stadiums by internationally acclaimed architects the government is worried that its citizen will not live up to Western standards when it comes to manners. As I know from personal experience spitting is widely practised in China and so is jumping the queue (if there is a queue at all). Also elderly men sporting white sleeveless undershirts are a common feature of many Chinese towns. According to the German weekly Die Zeit has the Chinese government proclaimed a day of queuing in Beijing on the 11th of February when 12’000 volunteers explained to baffled Chinese citizens the joys and techniques of queuing. The government even fostered schools that teach manners and already 5000 courses have been completed. The newspapers in Beijing also print an English sentence each day in order to teach the citizens of Beijing the essential English phrases. And last but not least has the government built “fitness life zones” across the city. Those are little parks with basic exercise machines. 30000 volunteers teach Beijing’s citizens how to properly exercise. Arnold would have loved it! 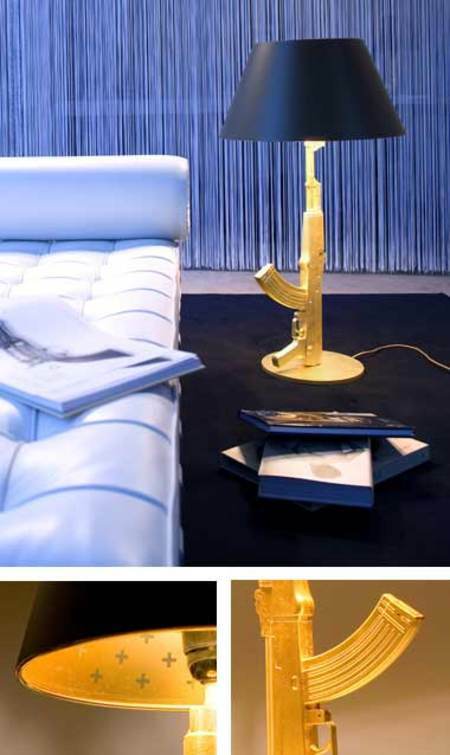 Picture: Russians love this Kalashnikov lamp from Mr. Philippe Starck. You might be forgiven to think that rich Russians only emigrate to London, they also can be found in Switzerland. For example the Russian billionaire Viktor Vekselberg lives in Switzerland and his company holding is based in tax-friendly Zug. One reason to come to Zurich, besides business, is that it safe in comparison to Russia and Swiss banks can look after the millions. And as many newly rich the Russians love to shop, especially for luxury goods, they are good customers of local furniture and clothes shops. A sales person in a luxury clothes shop in Zurich for example said: “Russians walk in, point on things and buy them bulk without trying. They do not ask about prices, they want brands.” The sales guy also said that Russians sometimes can be very abrasive if one not immediately understands what they want; as they have lots of money they believe the world is theirs. A sales staff at a designer furniture shop told me that Russians often walk through the sales room and want things immediately. Therefore they do not take it lightly when they are told that they have to wait for weeks for the Italian furniture to arrive. One Russian customer was for example not pleased with his hundred of thousands of Swiss francs of brand-new furniture in his flashy house and he told the sales staff to take everything back immediately. Then he ordered everything new. Another person told me that when he asked who would order a 2’000 Swiss Francs wine bottle in a restaurant the owner said: Russians. They just go for the most expensive item on the menu.